Mobile PCs represent a substantial portion of the personal computer marketplace, and their sales are growing faster than those of desktop computer models. Applications that are designed for Windows Vista are likely to be used on mobile PCs, so application developers need to consider mobile computing scenarios in feature planning and design. Mobile PCs free people to use Windows Vista in a broader set of scenarios and locations. They offer versatility with minimal compromise. Many people use their mobile PCs as their primary computing devices. Their mobile PC contains all of their critical personal and business data, knowledge and creativity tools, and entertainment media. In these guidelines, the term mobile PC refers to a self-contained, portable computer that runs Windows Vista or a later version of Windows. Common examples of mobile PCs include notebooks, laptops, and Tablet PCs. Note These guidelines do not pertain to mobile computing devices that run the Microsoft Windows Mobile operating system, such as Smartphones and handheld mobile devices, though some of the concepts may apply to these devices. Self-contained. A single integrated unit includes a built-in display, input devices, network adapters, and power supply. Self-powered. A mobile PC is capable of operating on battery power for varying lengths of time without being plugged into an AC power outlet. Portable. Easily moved from one place to another, a mobile PC can be used in diverse locations and environments. Versatile. In each new environment, the user can easily connect to available networks, power sources, displays, and other resources. Available. With a mobile PC, the user gains quick access to critical information and tools, including the full power of Windows Vista, anywhere. Natural. With pen input, the user can mark directly on the screen, take notes, and draw pictures in an expressive and natural way. Many Tablet PCs can operate in portrait mode, which is a familiar and comfortable position for the user to create and view documents. Social. Tablet PCs make computing possible in social situations where a laptop keyboard and its opened display might present a barrier to social interaction. With a tablet pen, the user can enjoy a single-handed, silent interaction method that demands less focus on the computer. Efficient. Direct manipulation of the screen by using a tablet pen is an efficient way to accomplish a number of tasks, such as panning, selecting, dragging, tapping, and pointing. Users can choose from a variety of mobile PCs, all of which run Windows Vista. 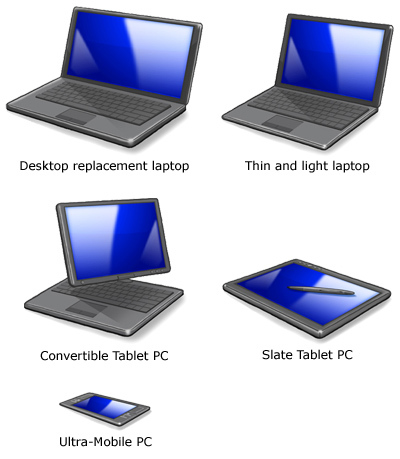 The following picture illustrates a variety of mobile PCs. Manufacturers continually improve the hardware for Tablet PCs, thin and light notebooks, and other mobile PCs. New developments in mobile PC hardware are likely to drive the expansion of this taxonomy over time. Applications that run on mobile PCs interact with a system environment that can change as the computer's location, hardware connections, and physical configuration change. When Windows Vista and the applications that run on it adapt well to these changes, they work together to improve the user's overall computing experience. With a system that works smoothly even as changes occur, users are free to focus on their tasks rather than on complications with the computer. Power management. How a mobile PC manages power is critically important to its user. Your application must participate in system-wide efforts to extend battery run times as long as possible and to respond properly when the user puts the computer to sleep. For more information, see Power and Device Awareness. Display transitions. Mobile PC users can expand the built-in display by connecting to an external monitor or network projector. Tablet PC users can switch from landscape to portrait mode. External monitors can be abruptly disconnected. See Adapting to a Flexible Display Environment. Network connectivity. Network connections come and go on mobile PCs. Users can connect to wired and wireless networks and to nearby computers with wireless networking capabilities. These connections can occur in public locations, at home, or in the office, and can involve both secure and unsecured networks. See Responding to Changing Network Conditions. Display improvements. Enhancements include DPI scaling to improve readability on high-resolution screens; improved cursor feedback for Tablet PC users; and better support for the use of external monitors and network projectors. Pen and touch flicks. Simple gestures are available in Microsoft Internet Explorer, the shell, and many applications. Windows SideShow. Users can view essential information while their mobile PCs are off or sleeping. Improved text and shape recognition. New improvements enable developers of ink-enabled applications to include better recognition, editing, and selection models. Personalization of handwriting recognition. The handwriting recognizer can adapt to users' individual handwriting styles. Touch input. On Tablet PCs with touch input, users benefit from having an additional pointing and interaction method that is always available. Improved power management. Power settings have been simplified, and the system behaves more predictably when the user puts a mobile PC to sleep or turns it off. Communicating. Mobile PCs are frequently used as communication hubs. On their mobile PCs, people use e-mail, instant messaging, blogs, and other means to communicate with others. Retrieving and referencing information. Users can get more out of their social experiences by retrieving information on their mobile PCs. For example, a student accesses supplementary information during a lecture, or a manager quickly checks her facts before commenting on an issue during a meeting. Planning and navigating. When mobile PC users travel to other places or visit unfamiliar parts of town, they might want to retrieve maps, directions, information, and ratings for nearby restaurants or attractions. Users might want to aggregate different sources in a central document or container. Reading, annotating, and updating documents. Users commonly catch up on reading when at home, in transit, or at other places away from their primary work area. The ability to quickly add markers, highlights, notes, and diagrams to documents is important to many users. Sharing information. Users might want to share information by showing it on a display or projector, by printing it, or by transmitting it electronically. Preparing for and making presentations. Mobile PCs are an essential presentation tool. Users might create a presentation, transport it to the meeting location, make quick edits at the meeting, connect to available presentation hardware, and deliver the presentation-all on the same mobile PC. Note-taking. With Tablet PCs, users can silently take notes within a social situation where tapping on a keyboard might distract others nearby. With a tablet pen, users can easily take notes, combine text and drawings, and annotate presentations and documents during a presentation or lecture. Writing and drawing. Mobile PC users can write and draw in a quiet place: at home, at a library, or at a café. The tablet pen is an expressive and natural tool for writers and artists alike. Consuming and sharing entertainment. Users can watch movies at home, in hotel rooms, or while in transit. By connecting a mobile PC to a TV, projector, or sound system, users can share entertainment media with one person or many. 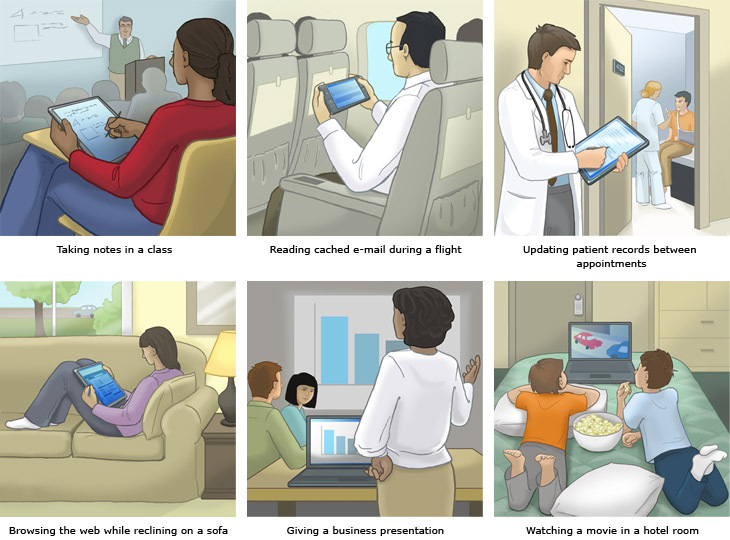 Mobile PCs are used in many more locations and environments than desktop computers, as shown in the following illustrations. These environments differ in a number of ways from an office desktop environment, in which a computer sits on a desk and the user focuses on the computer. These differences not only affect how the user interacts with your software, they also create opportunities and difficulties. Working surface. The user might lack a desktop surface on which to place a desktop computer, mouse, and other items. The user might hold a Tablet PC with one hand, while manipulating the user interface with the other hand. A mobile PC might rest on the user's lap, an airline tray, a car seat, or café table. User attention. Social interaction might prevent the user from focusing full attention on the mobile PC. The environment might be a source of interruption and distraction (positive or negative). The user might be more averse to interruptions than usual. Information sharing. Social interaction in a meeting can create unexpected opportunities to retrieve and share information. The user might need to quickly retrieve a document or information. Delays that are imposed by system or application startup, or difficulties in retrieving documents, can hinder this activity. Etiquette. The sound of typing or audio feedback can distract other people. An open laptop lid might be perceived as a barrier between the user and others nearby. Environmental resources. The working environment might lack resources, such as network connections, power outlets, and proper lighting. The user, and Windows Vista, might be forced to deal with resource limitations in ways that affect your application. Access to software and support. The user might not be able to complete registration processes, software updates, or feature installations that rely on installation media, access to support material, or Internet connectivity. Consider how your users accomplish work both in the desktop environment and away from the desktop. Support them in working effectively on the mobile PC in all types of environments and social situations. The mobile PC is an indispensable tool for users and affords great opportunities for application developers.